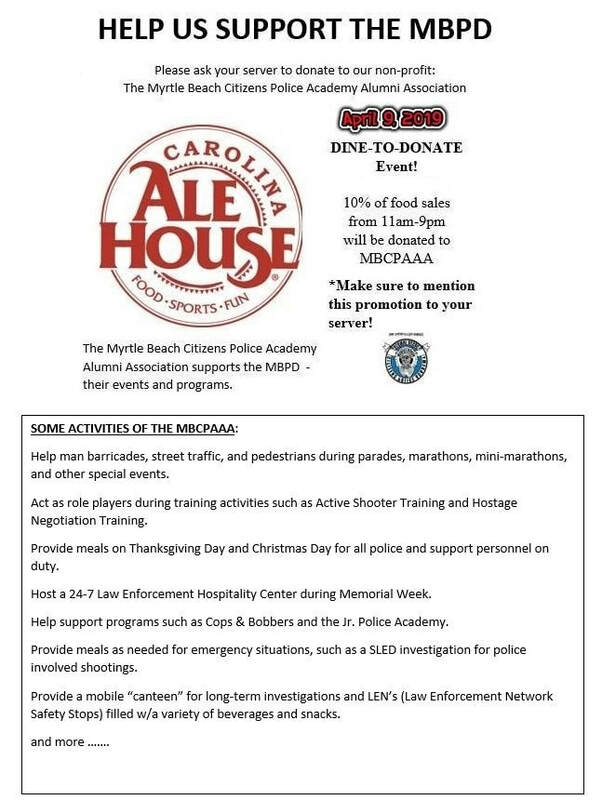 What time: 11 a.m. - 9 p.m.
Carolina Ale House is generously hosting a Dine-to-Donate Fundraiser for our Association. Ten percent of each food order will be donated to the MBCPAAA IF the people dining ask for the donation AND hand their server one of our Dine-to-Donate coupons. The donation includes the purchase price of food only, no beverages. Take out orders qualify as long as the purchaser presents one of our coupons. Help spread the word. Download the flyer and disperse @ area businesses, your work place, etc. (right click on the image & "save as" to your computer. Print from the download on your computer. Click on the image below to save to your desktop and print.